French onion soup was one of my sister’s favorite, so I know she would have loved this dish. 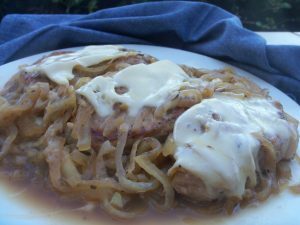 French onion soup with a boneless pork chop nestled in the broth with onions topped with melted swiss or Gruyère cheese. This would be just as delicious with chicken breast if you choose not to eat pork. 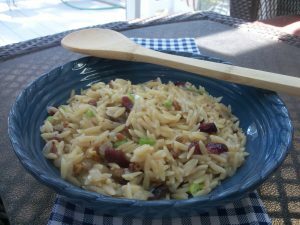 Serve this amazing entrée over white rice or cauliflower rice and wow your family with its incredible flavors. Enjoy! Brush the Dijon mustard evenly on both sides of the pork chops. Season each chop, on both sides with salt and pepper. Add 1 tablespoon of oil to a large skillet over medium/high heat and brown the chops on both sides, (approximately 2-3 minutes per side). Remove the browned chops to a plate and keep warm. In the same skillet add the remaining 1 tablespoon of oil, the butter, and the sliced onions, stirring well to coat the onions in the oil. Add 1 teaspoon salt and 1/2 teaspoon black pepper. Cook the onions, stirring only occasionally, until they’re golden brown and caramelized. This should take at least 15 minutes over medium/high heat. Add the wine, stock, and fresh thyme to the onions, making sure to scrape up the browned bits from the bottom of the pan. Cook an additional 2-3 minutes after the addition of the wine and stock, stirring frequently. Reduce the heat to medium and add the chops back into the skillet along with the onions. Cover the skillet and cook for approximately 20-25 minutes, or until the chops are no longer pink in the center. Remove the cover and add the shredded cheese to the top of each chop. Return the cover to the skillet. Turn off the heat, and allow the cheese to melt. Serve the chops on a bed of caramelized onions. Great for any party, this BLT dip is simple to prepare, and full of flavor. 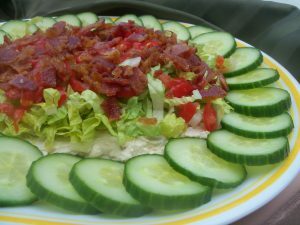 A cream cheese base with spices of onion powder, minced garlic, smoked paprika, and crumbled bacon throughout topped with lettuce, tomato and more bacon. Veggies are great dippers, but your favorite cracker would be delicious also. Since I don’t have all of my dishes here on the island with me and didn’t have a deep dish pie plate, this serving platter worked perfect. Enjoy! Combine 1/3 of the bacon with the cream cheese, mayonnaise, sour cream, cheese, and seasonings. Place in a deep dish pie plate. Sprinkle the lettuce, tomatoes, and the rest of the bacon over the spread. Serve with fresh veggies to dip. Ok, I know that these sour cream biscuits are not going to replace a soft buttermilk biscuit, but they are great for allowing you to have a warm soft delicious biscuit more often without the guilt of too many carbs. A bonus is how quick and simple it is to prepare, bake, and have these ready to serve for you and your family at any meal. 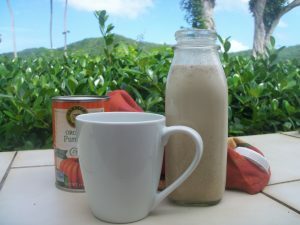 If almond and coconut flour are new to you, this is a great recipe to test them out. Enjoy! Preheat oven (and iron skillet if using) to 450 degrees. Mix the almond flour, coconut flour, baking powder, baking soda, salt, and sweetener. Beat the egg and mix it with the sour cream, melted butter, cream, and water. Mix the wet ingredients into the dry ingredients using gentle strokes. Once the ingredients are completely mixed to a soft dough set aside. Brush the hot skillet with butter or bacon grease. 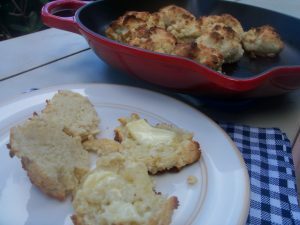 Scoop biscuits out onto the skillet. Return the skillet to the oven and bake for 12 to 15 minutes, or until golden. Remove from the oven and let cool for 10 minutes before eating. Banana pudding made into cheesecake! Wow, these little bites are insanely good! I had chocolate graham crackers instead of vanilla wafers so I used them knowing I wouldn’t be disappointed. Either way you have a winner. A cream cheese banana filling with slices of banana added sit on top of a cookie crust and topped with a homemade whipped topping. Now try to only eat one! Enjoy! Preheat oven to 325 degrees. Add cupcake liners to a cupcake pan. Combine the vanilla wafer cookie crumbs, sugar and melted butter. Divide the mixture between the cupcake liners (about 2 tablespoons per cup) and press into the bottoms. Bake the crust for 5 minutes then remove from oven. Allow to cool while you make the filling. Reduce oven to 300 degrees. In a large bowl, mix the cream cheese, sugar, and flour until combined. Scrape down the sides of the bowl. Add the sour cream and mashed bananas. Beat on low-speed until well combined. Add the vanilla extract and the first egg and beat slowly until mostly combined. Add the remaining egg and mix until well combined. 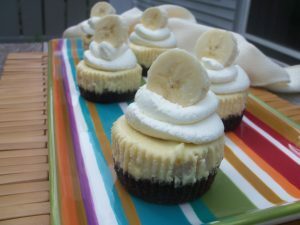 Add a small amount of filling to each cheesecake cup, then add a couple of banana slices on top. Add additional filling on top of the banana slices, filling each up until mostly full. 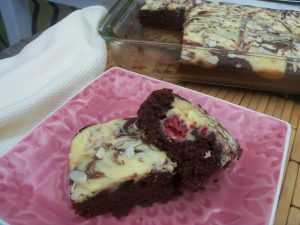 Bake the cheesecakes for 18-20 minutes, then turn off the oven and leave the door closed for another 5 minutes. Crack the oven door and allow cheesecakes to cool for 15-20 minutes, then put in the fridge to finish cooling. When cheesecakes are cooled, remove them from the pan. To make the whipped cream, add the heavy whipping cream, powdered sugar and vanilla extract to a large mixer bowl. Whip on high-speed until stiff peaks form. Pipe a swirl of whipped cream on tip of each cheesecake and finish off with a banana slice and vanilla wafer. Refrigerate until ready to serve. Cheesecakes are best when well covered for 2-3 days. I have fallen in love with peppadew peppers! I love the hint of heat with the sweetness of the pepper. There are so many delicious creamy fillings you can fill these little gems with. This one has just two ingredients, but the combination with the pepper just pops in your mouth. 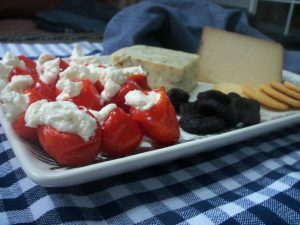 If your local grocery store has an olive bar, sometimes you can find peppadew peppers there and they will not be smashed in a jar and stand up better for presentation on your serving platters. Either way you and your guest will find these irresistible. Enjoy! In the bottom of a food processor or blender combine feta and cream cheese. Process or blend until smooth, light and creamy. Season with pepper. Transfer filling to a ziplock bag. Snip the corner off of the bag and pipe filling into peppers. 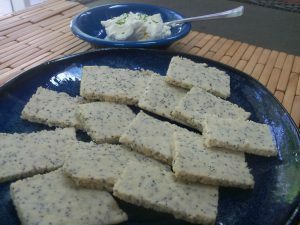 These low-carb crackers are simple and easy to prepare, and taste great by themselves or with any delicious topping you choose. They have become a staple in my kitchen. I have found if you are using a stone baking sheet you do not need to use the parchment paper while baking, because the crackers will not turn golden brown. Enjoy! Preheat oven to 350 degrees and adjust rack to middle position. Stir together almond meal, poppy seeds, coconut oil, salt and egg white until incorporated. Lay a 16-inch long piece of parchment paper on the counter. Pour dough onto parchment paper and cover with an additional piece of parchment paper. Using a rolling-pin, roll the dough to an 8×12-inch rectangle. Uncover and cut the dough into 2×4-inch crackers with a paring knife. 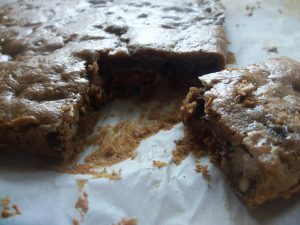 Transfer parchment paper with cracker dough onto a baking sheet. Bake for 14 minutes, until golden brown. Cool to room temperature.